conversations. 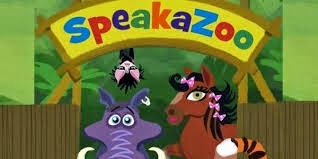 The characters are fun even for older kids and after the animal talks to you there is unlimited time to formulate an answer, hold down the microphone key and reply. A great way to work on conversational turn taking, problem solving, answering questions and even some social skills. Don't Let the Pigeon Run this App is a $4.99 app which is a take off of the Mo Willems book series. 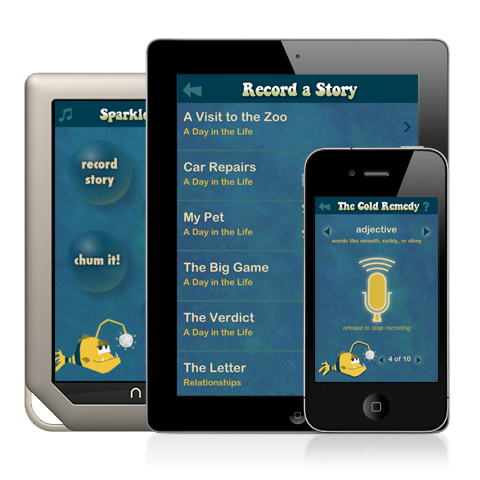 What is great about this app for AAC users is that you record your "voice" as part of writing the story and then you hear it read back. recording a message to go with your drawing. Perhaps more fun is your student adding stickers and drawing on photographs (or your student directing you to add stickers and drawings to photos) and then recording a message to go with the embellished photo. Tell About This come in a free and paid version for $2.99 which is well worth the money. The app simply shows a photograph and asks a question about it. The question is read aloud with highlighting. Your student records an answer which can be saved and shared. Even cooler you can add your own photos with your own prompts. So fun to take pictures of common routines or unique evens and ask students to create messages on their devices to tell about them. them in. Your recorded word is then inserted into the story. Great for working on parts of speech or working in groups. Chatterpix Kids, Chatterpix and Facetalk are all free apps with add an animated mouth which speaks your student's recorded audio to photographs. You've been working on AAC all school year. Motivating, modeling and moving out of the way while your students blossom with communication. Now it is summer. Your students will be in swimming pools, lakes, sprinklers or even hot tubs. What to do? Here are some ideas on how to make communication continue to happen in the water! Print boards on waterproof paper and use them in the water. Waterproof paper can be purchased at Staples or other stores or online from Amazon or specialty companies. Print communication symbols, boards or spelling boards on tee shirts, bandannas or fabric to use in the water. You can also buy shirts or bandannas. Communication partners can wear a tee shirt or tank top or carry a cloth to be used in or around water. Finally, though I don't know if I would risk it, you can purchase waterproof cases for most electronic devices. So if you are feeling daring you can give that a shot! Do you have a creative solution? Please send pictures! Today Southern Methodist University shared a study which focused on "low IQ" learners and reading. The study found that verbal students with IQs between 40-80 increased reading skills, usually to a first grade level or higher, with persistent, intensive instruction. This study should feel obvious - students with intellectual disabilities who receive about an hour a day of research based reading instruction make more reading progress than those who do not. But it isn't obvious. Most people, including special education professionals, assume these students will never learn to read. In fact in 15 years of teaching special education I was never once given reading textbooks for my students. I had an old copy of the "Edmark Reading Program" which teaches only sight words but I paid for the Simon Sounds it Out software and Reading A-Z out of my own pocket. However, most of us in the field and most parents of children we teach, know that literacy is not a priority for our students. Not only is it not a priority it often isn't anywhere on our curriculum. Not anywhere. No time of any day is spent teaching reading skills. This is true most of the time, though there are exceptions. Plus the more physically or multiply disabled the student is the less likely we are to teach reading. We might do some work with environmental print or safety signs but chances are we do not spend any time on letters and letter sounds, decoding or reading comprehension. Often times we hide behind our "life skills" curriculum goals. We are working on activities of daily living (feeding, toileting, hygiene), community skills (traveling safely, shopping) and communication (or at least I really, really hope we are working on communication). We still need to work on those skills but reading is just as much of a "life skill" as those other skills are. If you can read at a first grade level you can decode signs, simple directions, easy recipes, store signs with hours, menus, marquee's and more. 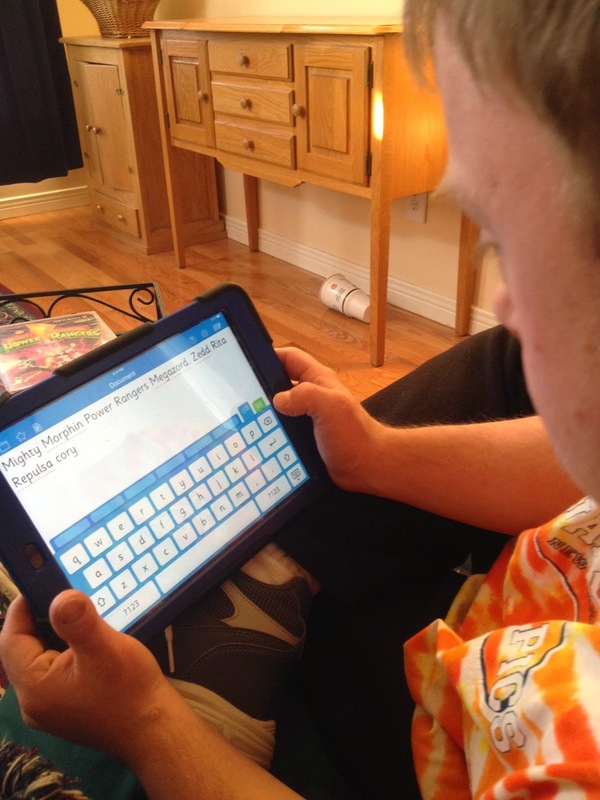 One time I had a phone call from a mom who joked that now that her son with Down Syndrome could read she couldn't skip over "wrestling" when they were looking at the TV listings and what was I thinking teaching him to read? Often times I am asked, "How do I teach this student how to read?" 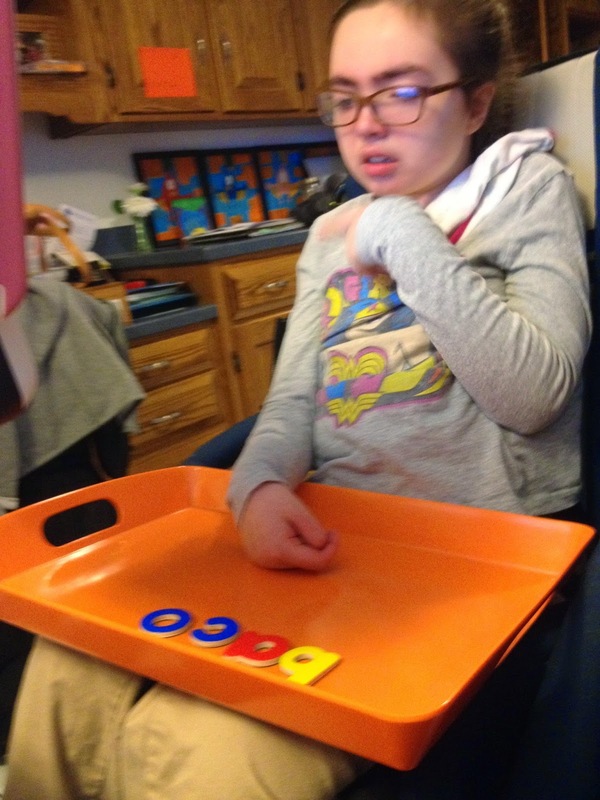 The student in question usually has cerebral palsy, Down Syndrome, Rett Syndrome, Angleman Syndrome or another complex disability. My answer is always the same. We teach that child how to read the same way we teach any child how to read. Meaning that we teacher letters and letter sounds. We teach sight words (but not JUST sight words). We teach blends and digraphs and prefixes and suffixes. We teach skills for increased reading comprehension. In short, we TEACH. If the student can't speak or move we adapt our instruction instead of dropping it altogether. We find a way. We find a way because that is our job!